On behalf of the FLEXspace core team and over 3,200 community members, we are proud to be accepting the 2018 Focus on Efficiency award at the California Higher Education (CHEC) Collaborative Conference. The award recognizes innovative practices that have been implemented to improve operational performance, services, and outcomes for California Public Higher Education. Improving student success through engaging learning experiences is a strategic priority for higher education across California. Sharing exemplary learning space designs, research, and planning strategies within and across institutions can help campuses accelerate opportunities to support student success while addressing common challenges. Realizing the need to streamline planning, the CSU Chancellor’s Office and the California Community College (Foothill-DeAnza Community College District) partnered with the State University of New York (SUNY) system in 2013 to build an open library of learning environment designs called FLEXspace (Flexible Learning Environment eXchange at (www.flexspace.org). 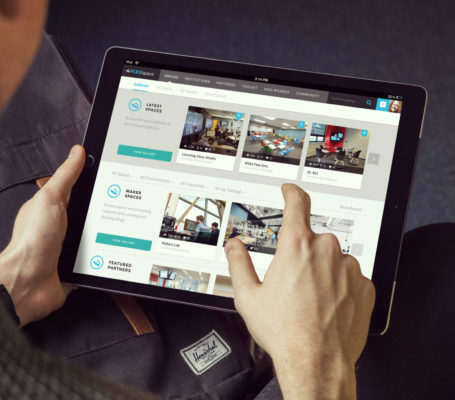 The vision for FLEXspace is to leverage a free ‘one-stop’ tool for best practices, detailed examples, and a community of higher education stakeholder groups to help campuses improve communication as they plan, design, build, and document learning spaces — ultimately saving time and money! Others have joined this collaboration including MERLOT, Educause Learning Initiative (ELI), Society for Campus and University Planning (SCUP), and the Consortium of College and University Media Centers (CCUMC). The FLEXspace collection contains images, videos, floorplans, and detailed specifications describing facilities and furnishings, technologies, and learning activities supported in each space which facilitates collaboration between facilities, IT, and academic technology departments on CA campuses. The ability to share sample classroom designs and develop reliable facility plans cost-effectively can produce efficient campus innovations. FLEXspace has gone through multiple design cycles to optimize its usability and value. The expanded mobile-friendly platform provides allows users to take virtual field trips to view peer institution solutions, create a digital portfolio to document and showcase innovative designs, share best practices, collaborate with partners, and connect with an ever-expanding worldwide community of experts. Some campuses are starting to leverage FLEXspace as a cost-effective way to create an end-user facing classroom directory rather than build their own. Today, FLEXspace boasts over 3,200 members from 1,100 unique institutions across 54 countries, a core team of global experts, and an emerging research and evaluation group from industry and academia. FLEXspace will be a topic of the CCC, CSU, and UC intersegmental collaboration committee in academic technologies that has been underway for the last 9 months. Visit FLEXspace.org to learn more about what FLEXspace is and how you can leverage this incredible free open resource for your campus planning. Register to receive your free academic account so you can browse spaces and contribute spaces from your own campus today! Thank you for the continued support from our founding partner Herman Miller, and other industry partners including Computer Comforts, Shaw Contract Flooring, AVI-SPL, AvinEd and others.